Sometimes in a place like school where hundreds of confused children are sent to figure out themselves and life in general, there are awkward situations. Sometimes, though, it is just plain chaos. School fights fall in the latter category. You will undoubtedly see tons of kids getting into fights and countless others asking how to win a school fight. Well, the only “victory” there is, is not getting hurt and making sure the other person doesn’t get injured as well. It is a bad idea. Seriously. Provoking your opponent only causes him to slip out of control and do things that are dangerous and may be even fatal. If it is a bully problem, you want to stay cool and teach him a lesson, not do or say something that might render him unpredictably dangerous. To know how to win a school fight, you need to know how to withstand one. You want to stand your ground at all times. Letting the bully have his way would lead him and others to think you are weak and you would just end up getting oppressed all the time. Not cool. You aren’t there to prove your physical dominance over anyone. That is just like a bully. Standing your ground and defending yourself will not only get you more respect from others but even the authorities will go easy on you if they know that you were making decisions with a calm mind. You may find yourself at a physical or psychological advantage during a fight. Use it to defend, not attack. Using undue amount of force would only result in injuries and more trouble hence. Not the smartest idea. Yes, you got it. Getting into a school fight is the last thing you should do. Try and avoid a fight at all costs but in the off case you do find yourself in a confrontation, don’t back down. There is a fair chance that the fight could be avoided altogether. Try and talk your aggressor out of it. Convince him that this is a lose-lose. If he does not comply, oh well at least you can tell the authorities you tried to reason with him! As strange as it may sound, this does prevent further unnecessary fights. Actions like not backing down or getting back up from a punch go a long way in this. Even something like looking your bully straight in the eyes is a good way to start off this process. How to win a school fight? Defend yourself. The priority here is you. You do not want to get hurt at all. So don’t hold back on protecting yourself out of some misplaced sense of punch-for-punch “honour”. If you can land a punch without taking one, do it! Throwing a tantrum or sending threats will only make you come across as unstable and mad. The authorities do not go easy on that sort of a thing. So instead of acting up after the fight, just stay cool and explain to them everything that happened with an open mind-set. If you feel that something really troublesome is going to happen, don’t hesitate to report this to your guardian or mentors. You need all the support you can get in matters like these. Having someone who understands your situation on your side is a big psychological help! 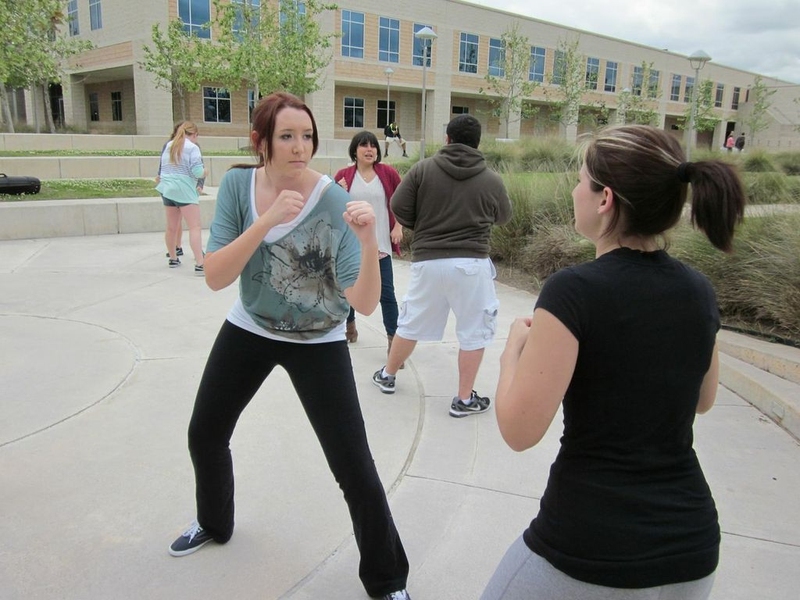 Avoiding a fight situation simply doesn’t work sometimes and you may be forced to defend yourself. Over centuries, human beings have perfected ancient crafts of harnessing the human body and spirit to protect oneself. Among the countless techniques that have been devised, Brazilian Jiu-Jitsu or BJJ really stands out for its effectiveness for self defense. Here are the 3 typical submission techniques in BJJ that are especially effective for scenarios like a school fight. This is a great submission technique. First off, start with the over-under grip. Ensure your bottom hand grabs your top wrist and stretch your grip over the neck and under the shoulder. Next, grip his shoulder with your top hand with your fingers like a “claw”. This is called the tiger grip. Now that you’ve got the grip, remove your bottom hand and lock with your top with the latter arm facing downwards, making for a very strong grip. While your opponent is busy trying to block your grip, go for the next step. Re-grip his shoulder with your arm just as before and simultaneously block his wrist with your other arm. This will counter his attempts to throw off your hold. Finish up with the palm-to-palm grip as in the third step and make sure your ‘top’ arm runs across his neck and not his face or chin. This tight hold will definitely make him submit. This is a takedown technique which is used by police officers to take down criminals, so it definitely counts in knowing how to win a school fight. Start off by shaking off the other guy’s grip on your shoulder or neck. Once you have broken his grip while parrying his gripping arm, pull your attacker towards you by dragging his arm. Keeping your face and body across his back, proceed to place both arms around your opponent’s waist. In this grip, bring in the heel of your forward foot down on the Achilles tendon of his backward limb. With a sweeping motion, lean back and bring him down. Just like the armbar, the heel hook is also mostly a ground technique, but it aims at your opponent’s leg. If you are in your opponent’s grip, throw your elbows into his thighs to get his legs uncrossed. Step over your opponent’s left (right) heel with your knee and hook your right (left) arm around it. Once you have done that, push your opponent’s hip with your leg and twist his heel with both of your arms to complete the lock. Server responsed at: 04/19/2019 11:24 p.m.